The Disney news this week is all about the newest vacation experience Disney has created. There is a lot of plusing going on at Disney destinations. Walt Disney was all about plusing an idea to make it better. This Spring the MyMagic+ system will be introduced! This promises to make the Disney guest experience even better. Some of the options used with MyMagic+ are already in use. 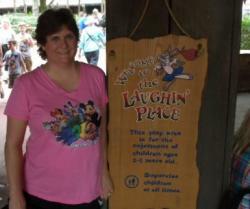 The interactive queues in the Disney theme parks are an example. The interactive games are, too. If you have sailed on a Disney Cruise Line ship you have experienced it. 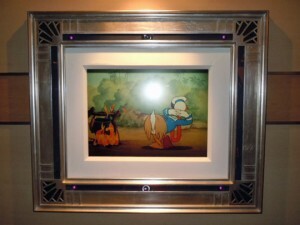 The Disney ships have interactive art! The key to your personal MyMagic+ experience will be your MagicBand. Disney News ~ What is the MagicBand? The MagicBand is a wristband with an RFID chip in it. Guests will each have their own MagicBand to wear throughout their stay. It will serve as your room key and so much more. Your theme park admission can be keyed into the MagicBand. It can serve as your PhotoPass card and be used for the new FastPass+ system. You can even use the MagicBand to pay for things. You may have noticed that the new room card keys don’t swipe anymore. You tap them to gain access to your room. That is to prepare for the new MagicBand means of access. We used the new FastPass+ system. We had a special FastPass+ card to use. Disney had a special podium available and you tapped the card on it. The MagicBand will replace the need for a card. I saw the podiums set up at the entrance to Magic Kingdom in Walt Disney World recently. Disney was actively testing this for quite a while. Have you hear the term My Disney Experience in the Disney news recently? My Disney Experience is really all about your entire vacation experience. Disney has a website for My Disney Experience. You can use it to connect reservations of family members. It allows everyone to see the itinerary. There is also an app that you can download to your mobile phone. The app works real time while you are in Walt Disney World. You can make dining plans through the app. You can also find out what the wait times are at attractions in the theme parks. The My Disney Experience will allow for any type of touring. You can plan things to each minute. If you are a meanderer like me, you can check times as you go. Our Laughing Place Travel has some pretty amazing apps, too. We are keeping up with Disney. You can find the best travel routes with out Transportation Wizard app. You can find out about all the Disney Resorts with our Resort Calculator. If you want to know where to eat OLP Travel has a Disney Dining Guide app, too! Hmm, I’m not sure how I feel about the wristbands… wearing them might get annoying… and I wonder how well this will work on children? Interesting. It definitely opens the door to discussion, Tonya. 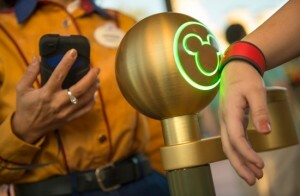 Disney will be able to track your day in the parks; which characters you meet, where you eat, etc. It is good marketing for them.